It has been quite a while since a post appeared on the blog, hasn’t it? Hopefully there are still some readers out there eager for some more stuff! Feeling a bit stiff when it comes to writing, I figured the best way to get it all started is to revisit my favorite anime of 2014! After this, I hope to slowly return to form. Truth is, I haven’t seen a lot of anime lately. We’re a few months into the new year and I have only seen two new series, which is a new record for me. Instead, the time has been spent watching older, completed, anime whenever the urge has kicked in. As a result, it has made me feel rather distant to the anime community. When it comes to the year 2014 in anime, my stance is that it has been a fine year. There has been a few standout series, but apart from them it has been more difficult to pinpoint any noteworthy. That said, I would like to give some honorable mentions to Hanayamata and Inou-Battle wa Nichijou-kei no Naka de. 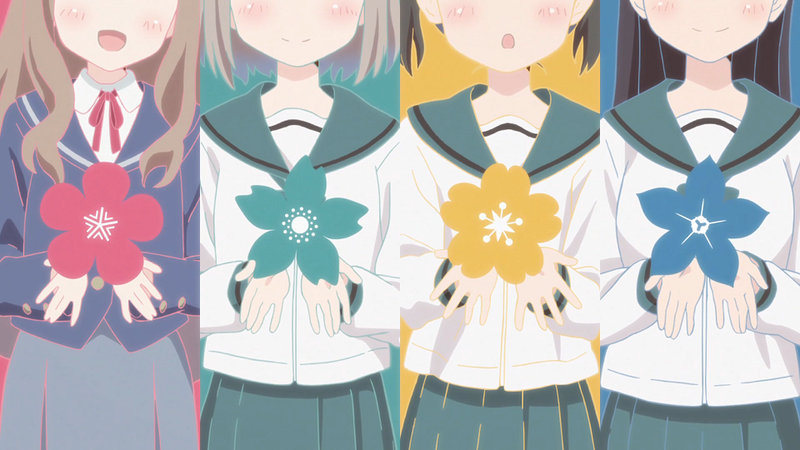 The former is your typical school series featuring girls forming a club – this time yosakoi – but it’s executed so well thanks to director Atsuko Ishizuka (Sakurasou no Pet na Kanojo, No Game No Life) it becomes a joy to watch. The latter is surprisingly my favorite anime by Trigger (Kill la Kill, Inferno Cop) and is a random comedy about kids gaining superpowers while doing nothing but fool around with them. I would also like to mention the movies Patema Inverted, Mahou Shoujo Madoka Magica: Rebellion and Tamako Love Story – especially the latter, which is a sequel to the mediocre and lifeless series Tamako Market. The premise to tell a love story sounds so impossible with the boring cast it has, but instead it works so perfect it’s almost magical. It’s a combination that shouldn’t work, yet works perfectly. Also, let’s not forget about the special episode called GJ-bu@ that’s a great, but ultimately fluff, sequel that only served to remind me how much I love GJ-bu. One disclaimer to whoever ends up reading the list below: I have yet to watch Mushishi Zoku Shou. I did watch the special episode in the beginning of 2014, but the series I have not. Had I seen it, however, chances are high it would end up as my favorite anime of the year. Nagi no Asukara is a strange beast. It’s a relatively long romantic drama that tends to be overly dramatic at times, yet I cannot help but love it. It is one of the very few anime that has made me actively engaged with it on a weekly basis, not to mention furiously ship characters with each other. Talking about doomed ships with @illegenes on Twitter has never been more emotionally devastating. It also helps that the series boasts some great character development and is a visual treat, especially as I find the use of blue in a water and winter landscape utterly beautiful. To me, this was as much a great series as it was an experience. This is the closest we will get an anime adaptation of Yotsuba. 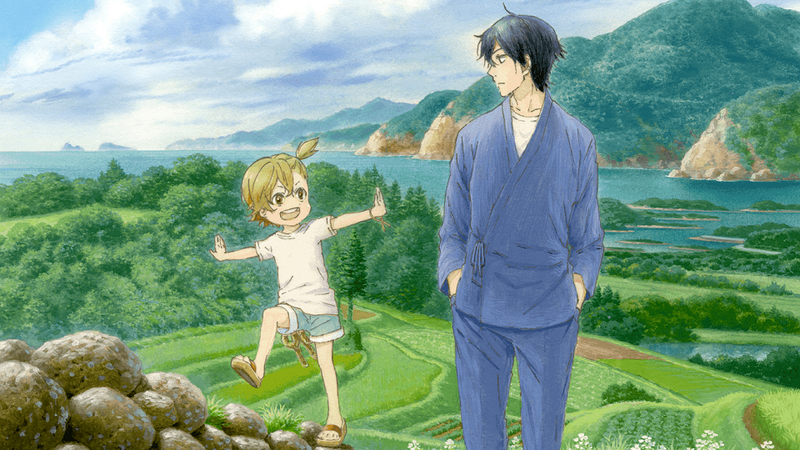 While Barakamon also tells the story of a young man doubting his future as a calligrapher, truth is it shines at most whenever it’s about hijinks starring the young and energetic kid Naru. She dominates the screen and has that sense of playfulness that can be difficult to portray, making it an utter charm to see whatever she comes up with next. Overall, one could say Barakamon is 2014’s feel-good anime. With this in mind, why did I end up having such a great time with Psycho-Pass 2? Especially as it’s deemed awful by fans of the first season, something I later learned after having completed it. To this, I’m not exactly sure. Perhaps I was in the mood for dystopian action? For one, I found the pacing much better. Spanning only eleven episodes this time around – all focusing on a single, larger, case – helped to give a sense of focus and urgency the predecessor lacked. Furthermore, it lacked the quasi-philosophical nonsense and instead mainly raised relevant questions when necessary and let the majority of interpretation up to the viewers. I immensely enjoyed the story itself, being a perfect series to marathon over the span of two days. It’s chockfull of small details and hints it keeps you on your toes, while also leaning heavier towards action than before. At the end, it all comes full circle and the obvious outcome plays out perfectly coherent within the rules of the universe. The only conclusion I can reach, judging by the weekly discussions I ended up reading, is that viewers expected to be spoon-fed and were so angry they cried foul rather than wait for the next episode. At least that is the impression I got, anecdotal evidence be damned. I wish I had written a post about the story shortly after finishing it, as I have by now forgotten many important details to give anything more than general arguments as to why the events in Psycho-Pass 2 were perfectly logical. Sadly, however great this sequel was, it will most likely end up redundant as the upcoming movie seems to ignore it completely. Great series, nonetheless! Plus, Akane is badass. 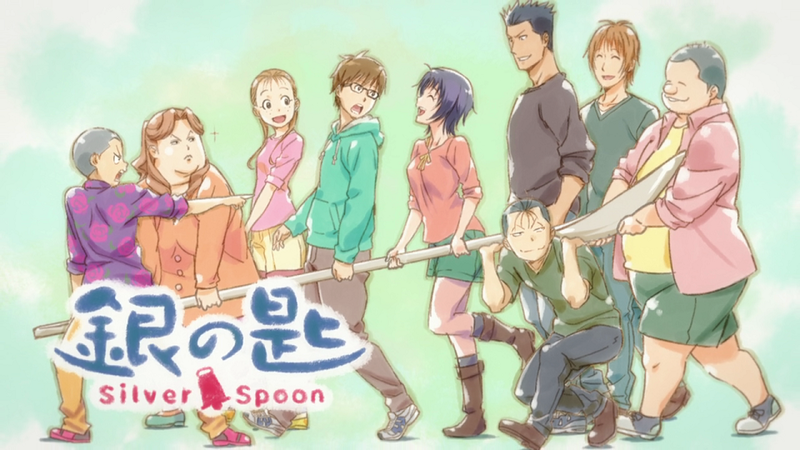 I was quite fond of Silver Spoon when it aired and even more so of this follow-up. Where the first season was all about establishing Hachiken’s character and finally coming to terms with his choice of attending an agricultural school (well, to a degree), this one is more about showing us how difficult a farmer’s life can be – so much Silver Spoon 2 eventually decides to kick out one of its characters from the cast! Hachiken’s journey to find his path in life may be far from complete, but after this season you can clearly see a possible outcome for him. It may be open-ended with no sequel in sight, but is a satisfying conclusion that, much like the first season, manages to tell its own narrative arc. Shame the manga is still unlicensed in English. Sword Art Online was the worst anime I had seen in 2012 and I still stand by it. It is a complete mess in terms of narrative, so much even a competent visual production cannot save it. 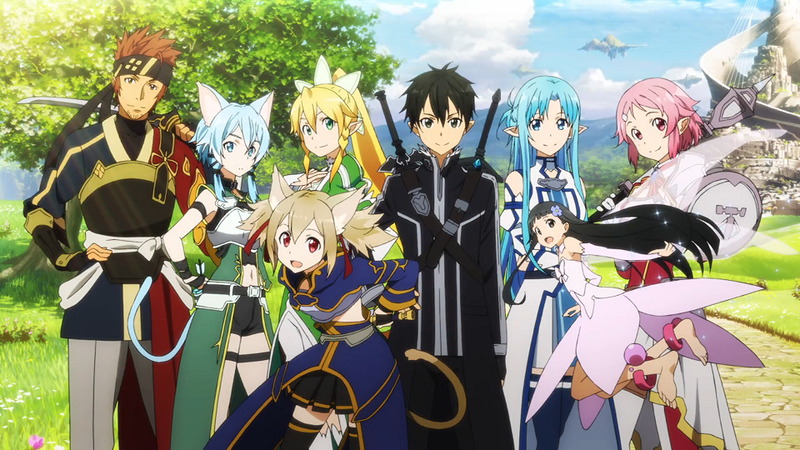 Jump forward to two years later and I really dug what Sword Art Online II had to offer. It was a complete opposite from before and here we are today, a moment when I call Sword Art Online II one of my favorite anime of the year – even better than Log Horizon. How did things change so drastically? For starters, the story is much more competent this time around. Reki Kawahara is a person I deem interesting and would love to learn more about, as this is the first time I so clearly have encountered a writer in constant growth. It was already obvious between the first two arcs in Sword Art Online, but the jump is much further when you look at Sword Art Online II. The stories themselves may not be particularly noteworthy, but the execution is simple and to the point. It’s the type of easy-to-swallow stories that really appeals to me when they work, which is the only decent way for me to describe how I feel. In Gun Gale Online, Kirito is tasked with finding a murderer. There, simple! Even more so when you look at the execution: no fluff, no overly philosophical musings… just a cool action story. Now, particularly Gun Gale Online does suffer from a slightly jarring backstory that borders on a retcon, but that is luckily the biggest offender this time around. My favorite arc is no doubt Mother’s Rosario, which follows Asuna and the new character Yuuki as they try to defeat a floor boss (No Kirito!). It’s such a well-told arc that comes full-circle with everything we have learned throughout Sword Art Online and Sword Art Online II (so much, it even changes the perception of the very first arc of the franchise!). Apart from being a great story in itself, it’s also because of a highly personal reason I hold it as a highlight of the year. I cannot shed any details as not to spoil the moment, but it made me remember a very emotional time from four years ago. I once experienced the very thing that transpires in the story and its portrayal is nothing but perfect. It mimics it so perfectly I could not help but cry my heart out. At this point, it was clear to me that yes, Reki Kawahara does understand video games after all. I’ve longed for a good sci-fi story in ages and I finally got one that engaged me. In full CGI, no less! Yes, you read that right. 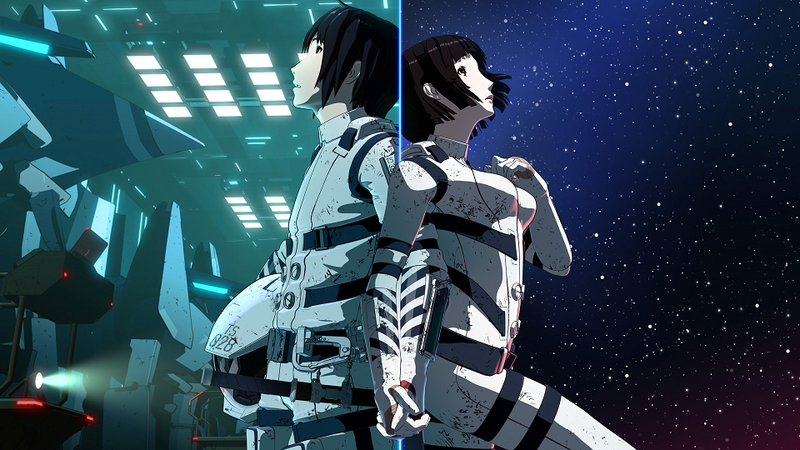 Knights of Sidonia is all computer-animated, everything from vehicles, backgrounds to characters. But it works! The lighting and rough look helps create very unsettling vibes to remind me how empty and vast space actually is. It’s also used to great extent in order to create scenes that wouldn’t be possible with traditional animation, something that creates intense scenes and gruesome alien confrontations. … which reminds me the second season should be airing by now! 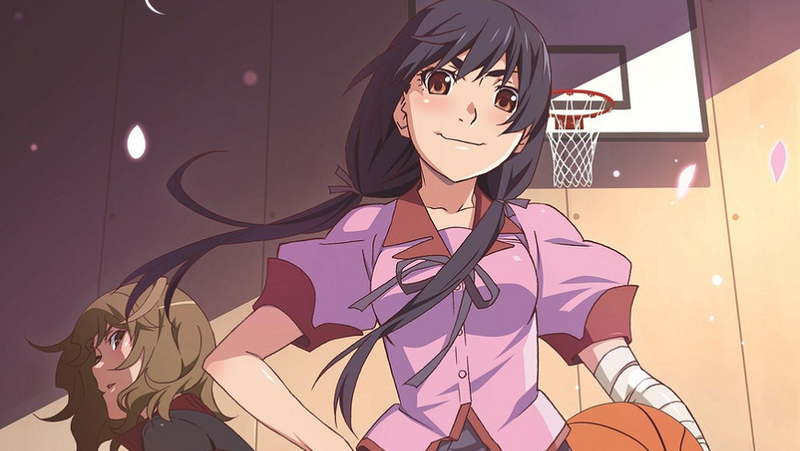 I must admit these Monogatari OVAs we receive every now and then – Nekomonogatari: Kuro, Hanamonogatari and Tsukimonogatari – are much more appealing to me than the full seasons. I cannot put my finger on why this is the case, apart from them being more visually polished. If anything, it’s because I end up watching all of the episodes at once. This creates a focused and pleasantly bit-sized approach to the stories. They also happen to be strong stories in themselves, with Hanamonogatari being one of the strongest in the franchise. Simply put, more Monogatari is a good thing. Pure creativity spread over the course of 26 episodes. A new episode means a completely new story with a completely new team behind the wheel. From musicals, to space ramen, to racing, to… anything! There are no limits apart from a cat, robot and dandy in space. What amazes me is how many of episodes I still remember, whether it’s the best or worst ones. That, in itself, is noteworthy. 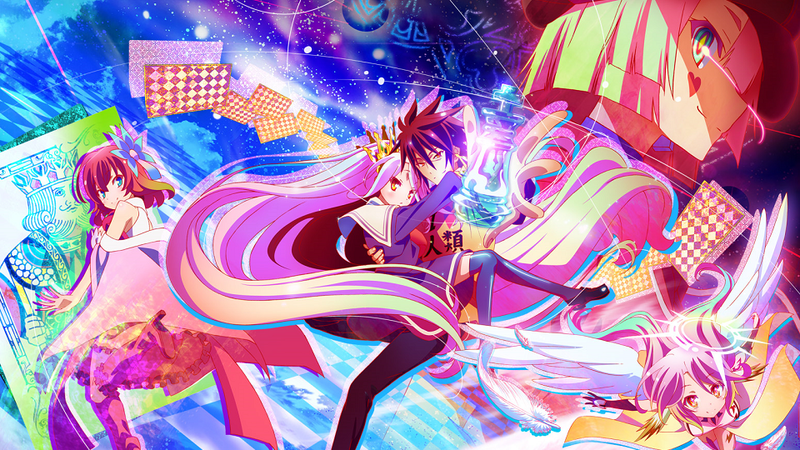 No Game No Life is dumb. It’s smug. It’s highly sexualized. It’s a great example of what not to show anime skeptics. But… it’s so much fun. It’s so insane. It’s so intense. It’s so entertaining. I cannot even bring myself to defend my love for it. All I hope is for a second season. Pretty please? This is it. It’s the shounen anime to recommend. It’s been three long years, but what a blast it has been. Despite having ended over six months ago (time passes quickly! ), it still feels strange to not have a weekly episode of Hunter x Hunter to look forward to. This is the longest weekly series I’ve followed. 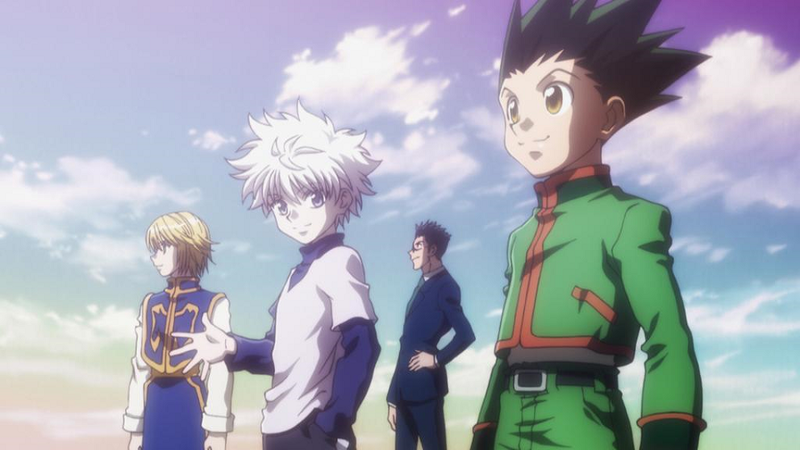 I could write a lengthy text as to what makes Hunter x Hunter so dang good, but in this case you’re better off heading to Guardian Enzo’s blog “Lost in America: Anime & More” on which he currently has written a whopping 199 posts on the series! All I can do is to give a huge thank you to everyone involved making this adaptation a possibility. May there be one day you’re able to animate more. How do I put it? Yama no Susume 2 is very personal and dear to me, as written before. It has potentially affected my life, making me remember an event from the past and an urge to pursue it (which, as a side-note, Honey and Clover also helped achieve). I want to go on an adventure. 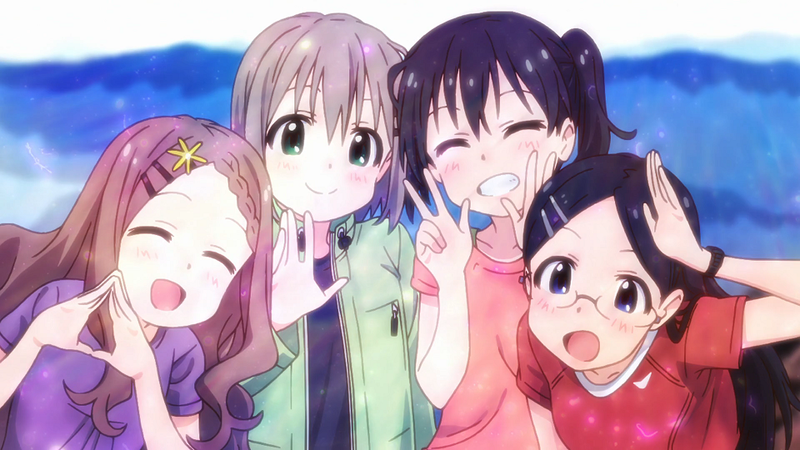 Yama no Susume 2 reminds me of that. Sometimes that is enough of a reason. This entry was posted in Anime, Barakamon, Hanamonogatari, Hunter x Hunter (2011), Knights of Sidonia, Nagi no Asukara, No Game No Life, Psycho-Pass, Reviews, Series, Silver Spoon, Space Dandy, Sword Art Online, Yama no Susume and tagged 2014, Anime, Anime blog, Entertainment, Favorite anime, Love, Yearly Lists. Yayyy, he’s back! And with Hunter x Hunter, Hanamonogatari, and Silver Spoon no less. Please blog more; we need more people with Good Taste around here. 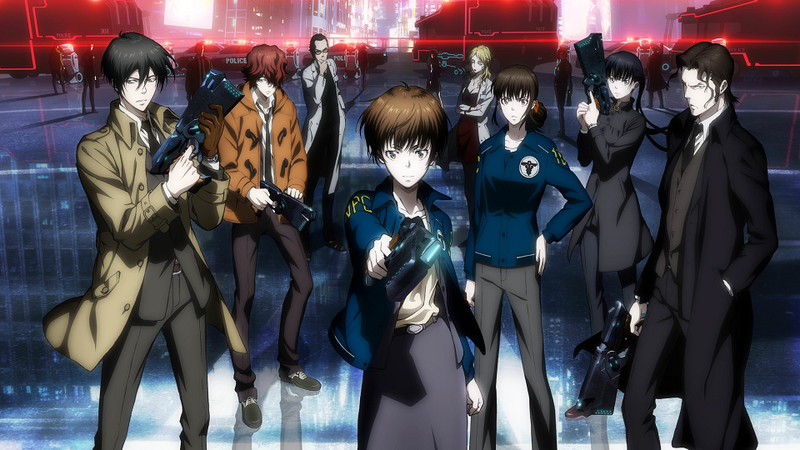 Not sure if I’d say if I have good taste as everyone else seems to despise Psycho-Pass 2, but I try! Don’t worry, Anime Viking should be back up as normal. Not sure how often I’ll blog, but I got at least an idea or two I know I can pull off within the week. Tamako love story worked a lot better than its prequel series because, first of all, the more uninteresting cast (Dera et al) only appeared in the beginning and didn’t get to interfere with the rest of the movie. That made the movie flow perfectly with just its Usagiyama cast. Plus, there’s this beautiful camera work and art direction. No reason for anyone to not love this visual treat. The script was pretty convincing, too. 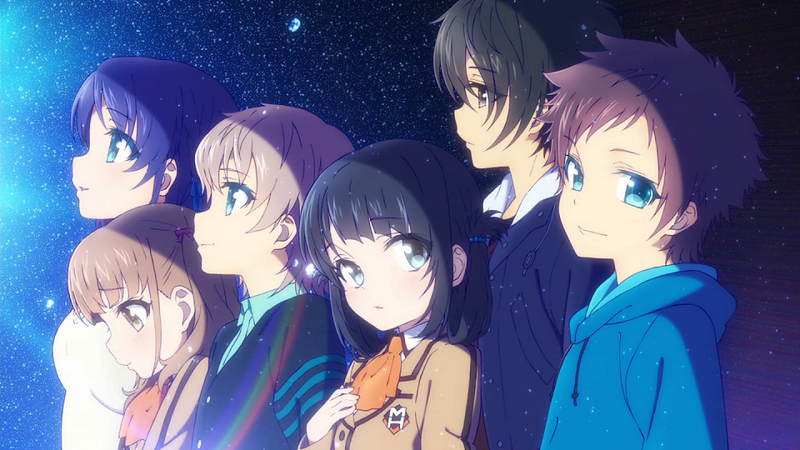 Ahh, NagiAsu was certainly one of the best-looking show last year. PA Works made perfect use of the show’s setting. I loved it, too! Indeed. It’s a shame we can’t see any Yotsuba anime, but thank god there’s Barakamon. Barakamon was short but it was really worthwhile. Would you like a sequel? Nods to Silver Spoon, Nogenora, HxH and Sidonia. Hmm Hmm. Yeah, throwing out the island cast was a good choice. I always felt it was a strange decision to include them as it was just too silly. Totally agree about the camera work too. Quite fond of the filter that’s used A LOT throughout the movie. Still, it surprises me it worked so well as I wasn’t too interested in the rest of the cast in Tamako Market. Hence why I feel like it works, despite it shouldn’t! I wouldn’t say no to a Barakamon sequel! More great and relaxing anime is a good thing! We still have nothing in common here, but a delighted “welcome back” to you, viking! Glad to see you writing again. Nothing in common, huh? So what did you end up liking? Nine of the eleven series you listed didn’t even meet my minimum “I’m interested enough to watch” criteria. I did watch SAOII, but I found the second half extremely disappointing compared to the Aincrad, Fairy Dance, and Phantom Bullet arcs. The other from your list I watched, No Game No Life, was pretty good in some ways but I couldn’t say it held a top spot for the year. But I like reading your stuff since our tastes are so different – no reason to read about things I already know about! As for what I found the best in 2014, in no particular order some of my favorites were Fate/stay night [Unlimited Blade Works], Isshuukan Friends, Zankyou no Terror, Shirobako, Black Bullet… I’d hate to say “read my blog” but I did manage to get a review of every season up last year for the first time! The worst of what I watched were Super Sonico, Aldnoah.Zero, Mekakucity Actors, Trinity Seven, and sadly my most anticipated of the year, Grisaia no Kajitsu. Currently catching up with 2015 winter so I’ll review that soon. Huh, that’s surprising. 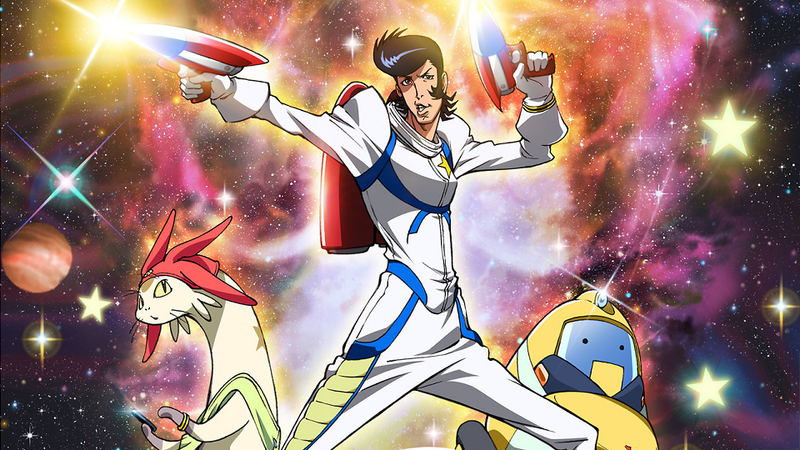 Especially as some, like Space Dandy, were anticipated. Even more surprising you found the second half of SAOII disappointing. I read your blog and think I might agree that GGO and MR might’ve been better as films, though. At least GGO feels like a perfect fit for it. Judging by your “Fall” post, we have very little in common. Much like mine don’t fit your “not interesting enough” criteria, the same goes for me with yours! Well, except Shirobako, which I count as a 2015 series as it finished this year. That was good. I looked into the source material for Mekakucity Actors and it interested me a lot. I think the anime was just poorly executed (speaking of the narrative, setting aside the terrible production). But yeah, even though we’re opposites with anime, I enjoy that. It makes reading your articles fresh and enjoyable for me. Good luck with your new start. Anyway, good to see you back, Marow! Would love to see more posts from you soon. Poor Kawahara. I think I’d almost like to speak with him myself one day. He seems really humble. Plus, although the interview didn’t follow up on it, he does seem aware of the criticism he’s received (in particular Asuna in a cage). I wonder how the story would be if it were written today. Well, variety is a good thing! What would you choose? I highly recommend Knights of Sidonia, especially as it now has a second season. As for NagiAsu, it depends on your mood. I fear it might be less engaging to watch it now that it’s finished, especially as the ending feels both conclusive and inconclusive at the same time (one matter is kinda brushed aside). If you’re interested, though, give it a go. Just be vary that the first few episodes feature an annoying Hikari to turn you off. Thanks! Look forward to them! I didn’t like Tsukimonogatari as much though and loved the majority of the S2 so we agree partially. Nadeko Medusa was the best part of Monogatari for me. Some compatibility is good, I guess! I really wonder how Togashi is faring, as the manga ended up in another hiatus shortly after returning (this time, ending right as the new story was starting). I hope he’s doing alright. I sadly doubt it’ll ever be finished at this pace. But hey, I guess it’s all about the journey rather than the destination in the end! We got a wonderful anime adaptation and a fitting ending even if it were to end prematurely. Tsukimonogatari was… strange. To me, it’s the most difficult arc to follow so far. I found it engaging, but I also had difficulty figuring out what significance it had. It’s a strange beast. As for my favorite arc… I’m not quite sure! Nekomonogatari: Shiro was nice as I like Hanekawa, Kabukimonogatari because I’m a sucker for time travel and Hanamonogatari because of its simply well-told story? Maybe? Yeah, we should be thankful indeed. So many tears and such visual and aural perfection. It’s just knowing this man’s potential, I’m sad in the thought we might not see even greater things. I’m a Shinobu lover and I liked Mayoi as an adult, too. I’m saving Teekyuu 4 (and its spinoff (the heck?)) till it’s finished. More fun that way! How many times should I read this until a new post appears 😛 ? TRazor! It’s been ages, it feels. As for your question, I honestly cannot give an answer to it. I could tell you the longer story if you contact me in private. What I can say, though, is that things have been… off. I’d love to write some more, but I’m struggling to even get started (despite getting ideas every now and then). There’ll no doubt be posts later this year, but in what form I’ve yet to decide. Well, it has been ages. Check your mail (live.se), fellow Taki-lover. Hi! I have indeed seen Sidonia 2. I ended up watchig it in a day, that’s how much I enjoyed it. Great stuff. Hopefully we’ll see a sequel now that the manga is finished. Yeah, I hope they’d fully animate the source material. I’m kind of skeptical on reading the manga, because my experience on watching the anime was just so great; I selfishly want to know the remaining story through the CGI animation. Your stance of Psycho-Pass season one and two is certainly unique.